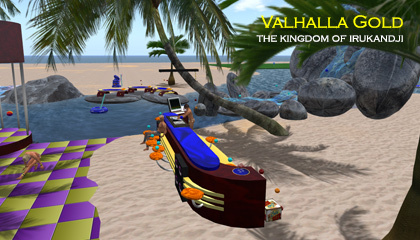 Valhalla Gold was a simulator on the Second Life virtual world during 2011 and 2012. Valhalla Gold was always intended to be a temporary simulator, just a place to hide and think while I worked out what I wanted to do next. 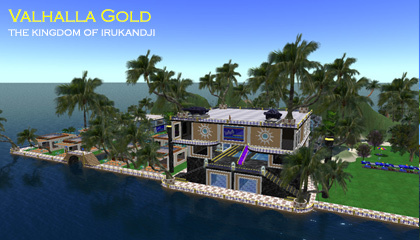 After Valhalla Gold, I bought a handful of mainland sims in SL - Korumburra, Julia Creek, Boobero, and Ladyvale - and a few months after that, I built Irukandji v2 in InWorldz. There isn't much more that I can say about Valhalla Gold. It holds no special place in my heart and was never really part of the Irukandji story. Indeed, few would remember it apart from the estate team. Nonetheless, Valhalla Gold is one of my creations so it has a page here for its photos, which can be viewed below.